Lamacchia’s REAL Training Course Kicks off in January! 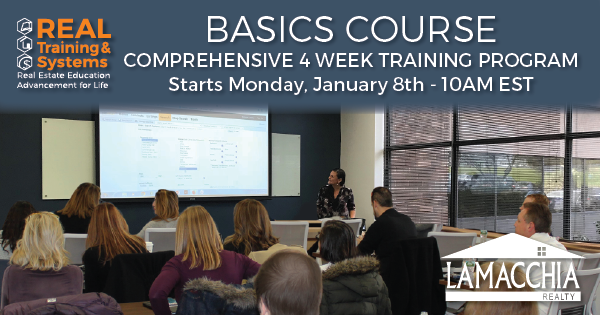 December 21th, 2017 – Lamacchia Realty is kicking off their REAL Training Basics Course on Monday January 8th 2018. This course will be offered to all Lamacchia Realty Realtors. This course was created in the summer of 2016 and is offered roughly every other month at Lamacchia Realty. It is primarily for new Realtors who have less than 3 years in the business, but all are welcome to attend. This course will consist of four weeks of live training, two days a week at Lamacchia’ s Training Center. It will provide a guide of how to sell real estate from A-Z. To hear directly from several Realtors who recently took the course watch the video below. Fill in your information below! The course will be run by Lamacchia’ s Director of Growth & Development, Jackie Louh who has personally sold over 600 homes at Lamacchia Realty prior to getting into management in 2016. Anthony Lamacchia, Broker/Owner of Lamacchia Realty, and several others from the Lamacchia Management Team will help to train on additional portions and topics. Lamacchia offers several other courses throughout the year and many are even offered nationally. Lamacchia’s trainings were also recently featured in Inman News. For more information on how you can be a part of this course fill out the form on this page.